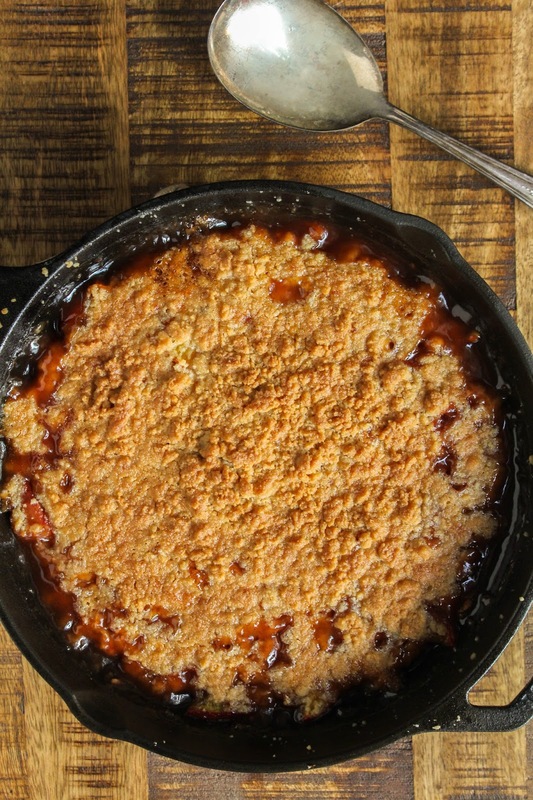 Loaded with fresh, sweet peaches and crunchy almonds, this Skillet Peach Almond Crisp is a simple and comforting summer dessert! One of my very favorite things about summer is the abundance of fresh fruits and vegetables available to cook and bake with. You don't have to look very far for inspiration! So of course for me that means lots of fruit desserts because well, we all know how much I love to bake sweet stuff. This skillet peach almond crisp is a very simple dessert. 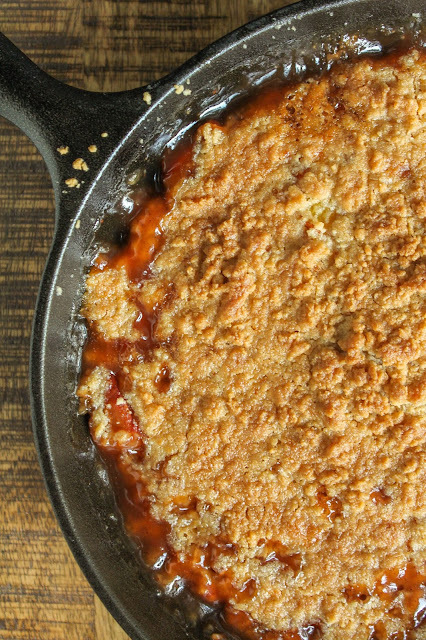 Made with fresh, juicy peaches and crunchy almonds, it's literally bursting with flavor. 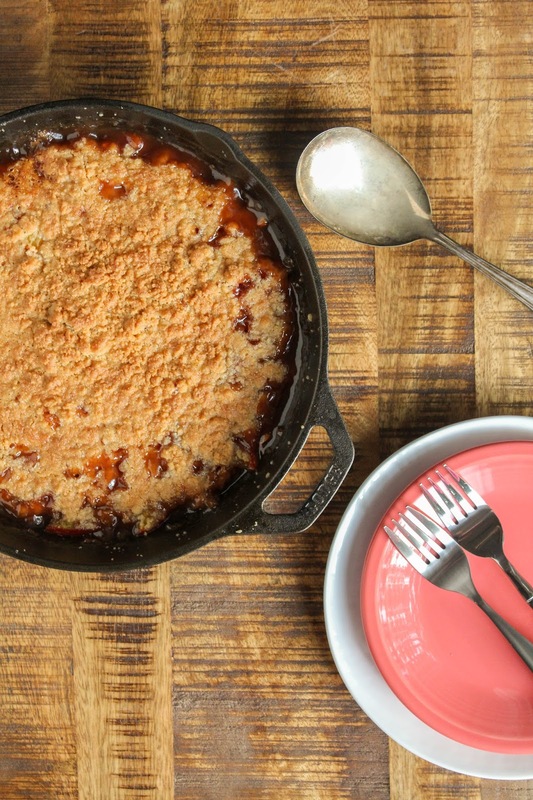 A sweet and buttery crumble topping turns crispy and crunchy in the oven. What more do you need? Well, maybe a scoop of vanilla ice cream right on top, but that isn't a must. The crisp is definitely delicious all by itself, but the ice cream certainly doesn't hurt. Preheat the oven to 350 degrees. Rub the bottom and sides of a 10" cast-iron skillet with the two tablespoons of butter. Add the peaches, almonds, brown sugar, granulated sugar, lemon juice, cinnamon, and salt to a large bowl and gently combine. To make the topping, whisk the flour, brown sugar, and salt together in a medium bowl. Add the butter pieces and mix them in with your fingers until clumps form and no dry spots remain. Transfer the peach mixture to the prepared skillet and spread out evenly. Add the crumble topping, breaking up into large pieces, over filling. Bake the crisp until the topping is golden brown and the juices are thick and bubbling around the edges, 35-40 minutes.